These 5-ingredient honey mustard chicken thighs are so flavorful and easy to make, they will be one of those recipes that will be your new healthy basics. Since we’re all about back to basics this month. I wanted to make sure you knew I got your back when it comes to getting dinner on the table. I get pretty carried away sometimes with talking about nutrition and such that I forget that you need to feed yourself and your peeps. Like, hello Katie, what’s for dinner? 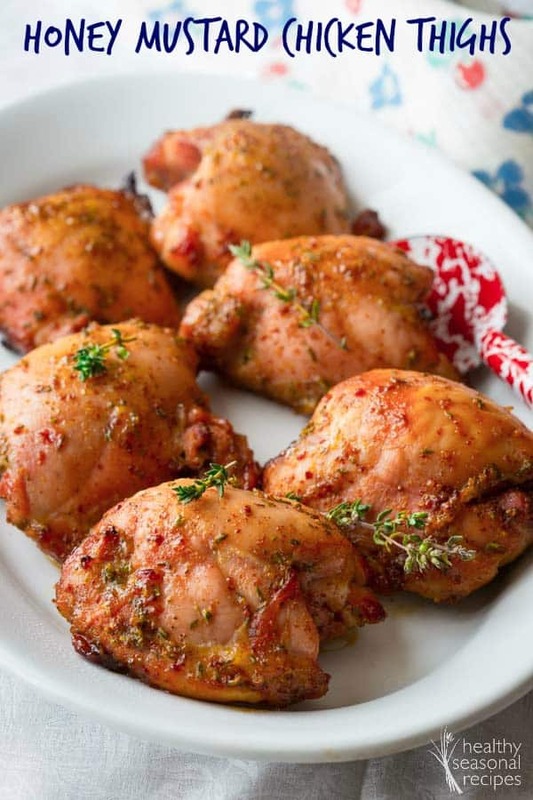 This healthy chicken thigh recipe is. Or it will be. I know some of you tell me that you make the same five recipes every week. And it is too hard to try a new recipe to mix in because the kiddos won’t eat it or something. I totally get that, and it makes me a bit crazy too. But the same five recipes can get pretty boring. Right? Right. So I am guessing you are pretty psyched to see a 5-ingredient recipe showing it’s pretty face around here today. You may even be thinking it could be a contender. Maybe, just maybe it will become one of those family pleasing dinner staples. I hope so. 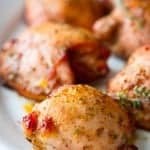 I loved the fact that this honey mustard chicken thigh recipe makes 6 thighs, enough for the four of us for dinner, plus two thighs left over for our lunches too. Jase and I eat salad with protein for lunch a lot, so these honey mustard chicken thighs were perfect for that. Hope you enjoy! 1. Make the honey mustard sauce — The healthy honey mustard marinade is a simple combination of mustard, honey, fresh thyme, and salt. I used brown deli mustard to really amp up the mustard flavor, but feel free to use whatever is in your pantry. 2. Coat the chicken — Fully coat the chicken thighs in the honey mustard sauce, making sure to get it into all the crevices (you may need to use your hands to really work it in!). 3. Roast the chicken — After the chicken thighs are fully coated in the honey mustard, arrange them on a parchment paper-lined baking tray (the parchment paper makes for easier cleanup). Roast the honey mustard chicken thighs for 40 to 45 minutes, and let them rest on your counter for a few minutes before serving. These flavorful chicken thighs pair perfectly with brown rice, noodles, or a simple side salad. Kiddos also love maple glazed carrots and garlic mashed potatoes. However you serve this honey mustard chicken, don’t be afraid to keep things super simple. This easy chicken recipe makes for a knockout entree, so you don’t need to worry about making anything fancy to pair with it. 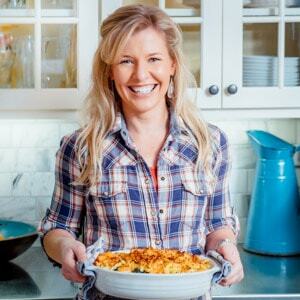 Do you use the same recipes every week or do you venture out into uncharted territory? Or maybe a combination of both? These easy honey mustard chicken thighs are perfect for busy weeknights! Kids love this recipe, plus it only uses 5 ingredients. Win-win! Preheat oven to 375ºF. Line a large rimmed baking sheet with parchment. Whisk honey, mustard, thyme and salt in a medium bowl. Add chicken thighs and turn to coat. Arrange chicken on the parchment-lined baking sheet, tucking them into neat thigh shapes. Roast chicken until cooked through and browned in spots, 40 to 45 minutes. Let rest 4 to 6 minutes before serving. Chicken is one of the best things you can have for leftovers! I always think it tastes so much better the next day anyway! I am always planning for left-overs now that both Jase and I eat them for lunch. I almost always try to make extra chicken now. I am so with you. I have the best intentions to plan a more elaborate meal, but 5-ingredients just has to happen most nights. These look delicious! 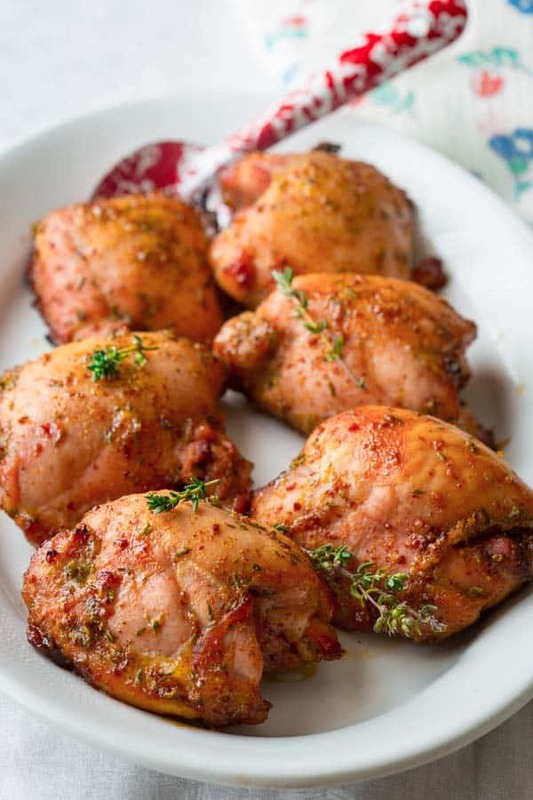 I love chicken thighs, they are so tender! I will have to give this recipe a try! Yes, I love how forgiving they are. You can totally overcook them, and they are still so tender. Good thing when you’re constantly multi-tasking like I am at dinner time. Thank you for pinning. And I love honey mustard too. I add both to salad dressing, and it makes it taste so good. Have a great day. I hope you and the fam like it Deanna. Hope you’re well and Happy New Year to you. I was telling my girls about the Mummers on New years day and thought of you. I can’t believe how easy AND delicious this looks! 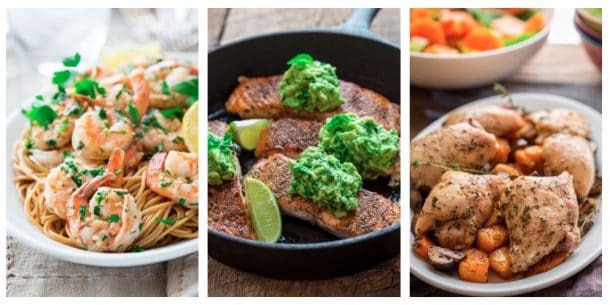 It looks like the perfect weeknight meal! Thank you Rachel. It really is easy. Have a great day. I LOVE honey mustard chicken. Thanks for reminding me how delicious it is – I definitely must make this 5 ingredient recipe soon! So glad to inspire Thalia. Have a great day my dear. 3. I definitely have a shrimp/chicken stir-fry that I make once a week, every week, and then a series of other quick & easy reliable dinners I keep in rotation. Frankly, I think life’s too busy not to have these kind of go-to meals! Thank you Christine. I laugh about the fact that I used to hate left-overs. Now I cook with the intention of making them. These look so so delicious!! Why thank you Ami, so glad you stopped by. I’m always cooking something new, but I’m sure that will change when I have kids. Love this as a new weeknight staple! I know what you mean, I cook something new every night still, so maybe not. 5 ingredients?! That’s it?! LOVE IT! 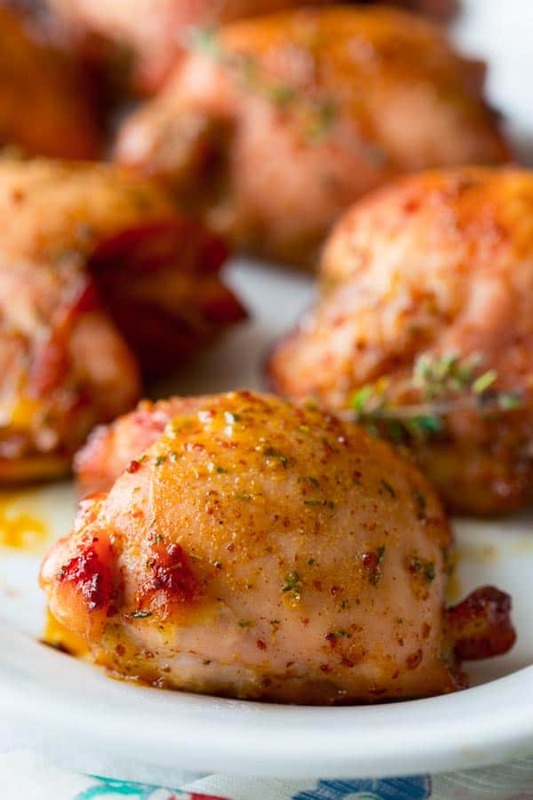 We’ve kind of gone chicken thigh crazy in our house…liking them better than the breasts lately. Can’t wait to try something new with them! I love chicken thighs too, especially that it is okay to accidentally overcook them, they stay juicy and tender. And I am always so distracted at dinner time that it has been known to happen around here once or twice. Ha ha. Hi! I’ve tried something similar before and liked the fact you added some fresh thyme to it. Just wondering though, if I wanted to toss in also some thinly cut potatoes, how would I do it? Do I place them at the bottom? Do I need to increase the cooking time at all? This is definitely a new favorite and will become a treasured standby! Does the cook time need to be adjusted if you have bone in thighs for this recipe? Making these tomorrow and I don’t want to over/under cook them. Thanks! Yes! They will take closer to an hour. Check to see if they are done all the way to the bone by making sure they are no-longer pink. Or if you’re comfortable with an instant read thermometer, check that they are 165 at the thickest part near the bone. This was so easy and absolutely amazing. This is definitely staying in the recipe rotation going forward! Oooh the flavors in this chicken!!! So good! Delicious (and easy to make) salad! We had it last night and my family loved it.